31st January 2019, New Delhi: It is that time of the year when the Government gets ready to present the budget for the coming year. Citizens also follow the budget carefully as their earnings and expenditures might directly or indirectly be affected by what the Government announces. With the Lok Sabha elections scheduled in early 2019, the biggest question that everyone has, is if the Government should present a comprehensive budget or an interim budget. 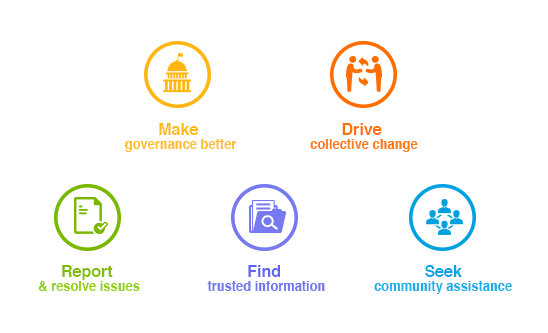 Continuing the trend for the fourth year, LocalCircles has compiled a detailed ‘Citizens Budget 2019’. 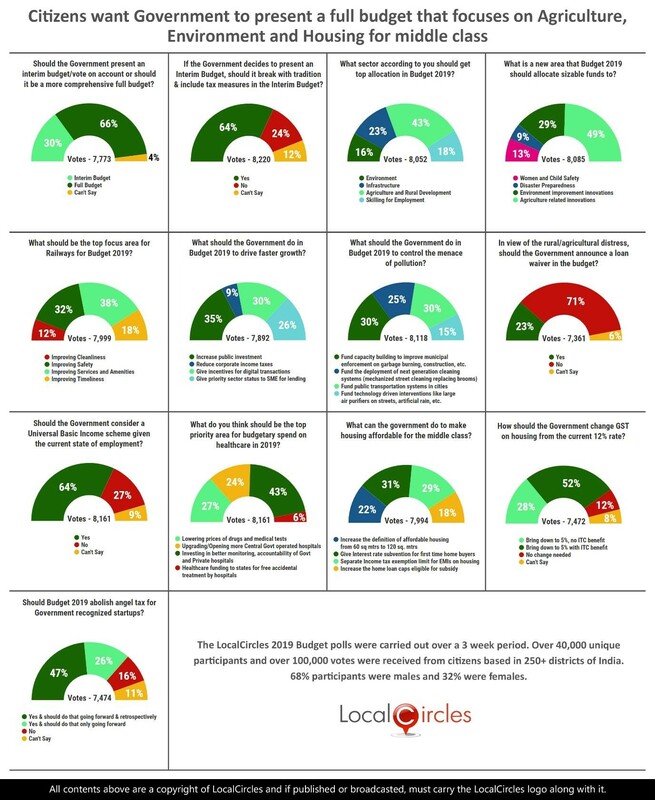 One of the largest study of its kind, the LocalCircles Citizen Budget 2019 received participation from citizens from more than 200 districts in the country. The survey covers areas like allocation priority, healthcare and expenditure, including priorities for Railways, startups etc. and more than 100,000 votes came in on the survey. • On sector wise allocation front, 43% of the citizens want agriculture to be the top priority followed by 23% who want infrastructure, 18% skilling for employment and 16% environment. Looks like citizens feel that the agriculture being the largest employer in the country needs more help and efforts from the Government. Interim Budget or Full Budget? A national interim Budget or a Vote-on-Account refers to the budget of a Government that is going through a transition period. The first question asked if the Government should present an interim budget/vote on account, or should it be a more comprehensive full budget. 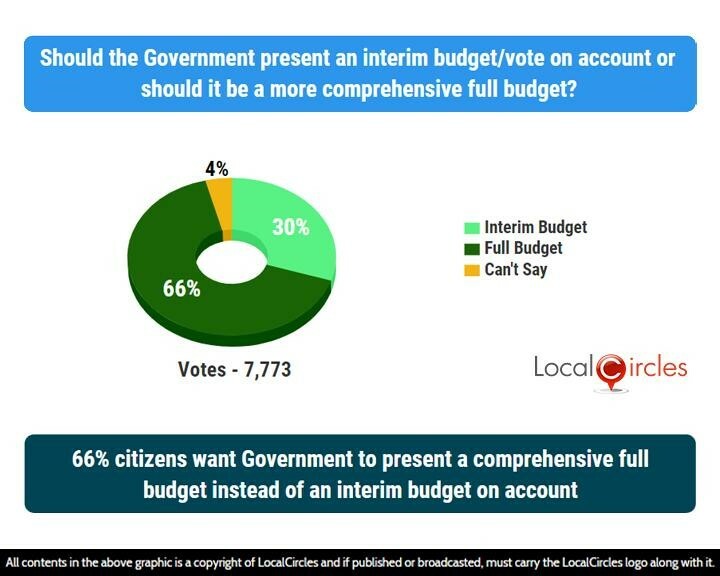 66% citizens said the Government should present a full budget while 30% said they should present an interim budget. The interim budget usually does not alter direct taxes since they need to be passed through a finance bill. 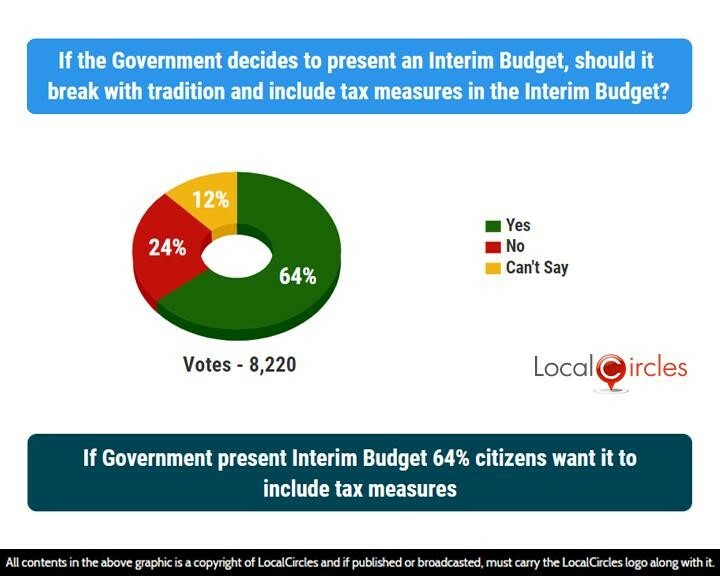 64% citizens said that if the Government presents Interim Budget, they should break with the tradition and include tax measures. 24% said they should not do it and 12% we unsure. 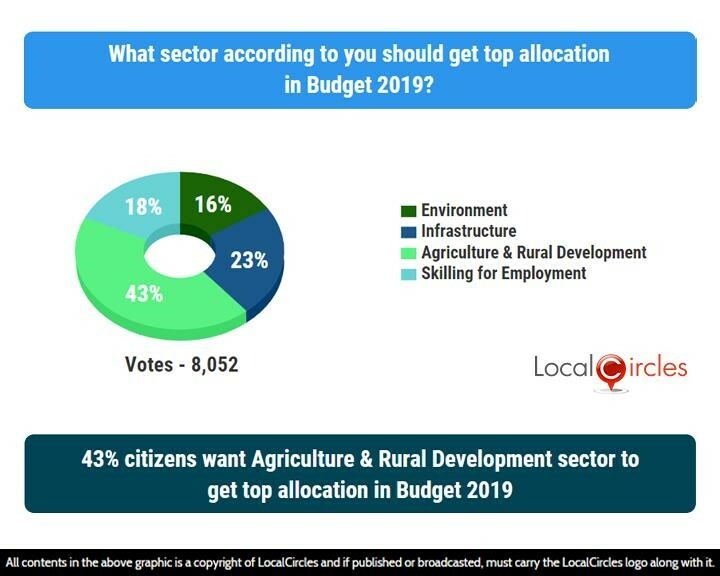 43% citizens said that Agriculture & Rural Development sector should get top allocation in Budget 2019. 16% said it should be Environment, 23% said Infrastructure and 18% said it should be Skilling for Employment. Agriculture has been the backbone of the Indian economy for decades now, but the sector has lately been in distress due to various reasons. With the cases of farmer suicides increasing every year, the need for innovation in the sector has become very important. 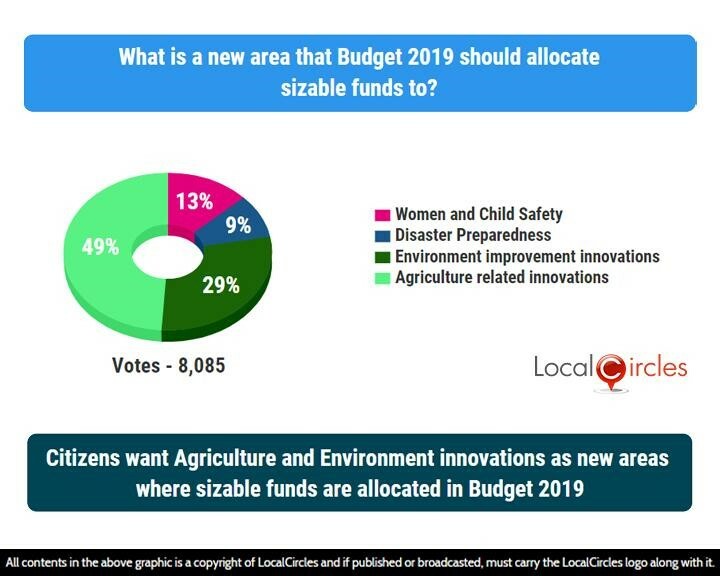 Citizens were asked which new areas should be allocated funds in Budget 2019. 49% said the area should be agriculture related innovation, 29% said environment improvement innovation, 13% said women and child safety, while 9% said disaster preparedness. The Railway Budget has been made a part of the overall budget and is now not presented as a separate budget. But this does not reduce its importance at all. It is the backbone of the Indian transport system and ferries millions of passengers from one point to another everyday. 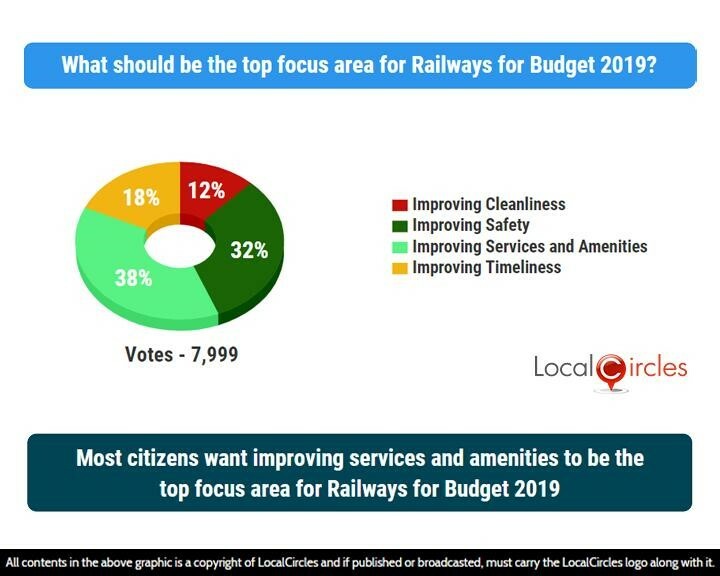 When asked what the top focus area for Railways should be for budget 2019, 38% chose improving services and amenities, 32% chose improving safety, 18% chose improving timeliness and 12% chose improving cleanliness. 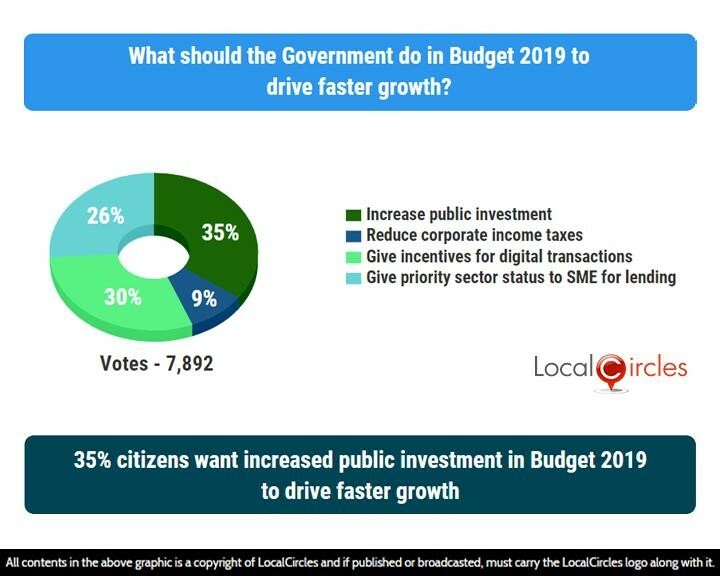 To drive faster growth, 35% citizens said there should be increased public investment, 30% said incentives should be given for digital transactions, 26% said priority sector status should be give to SMEs for lending and 9% said corporate income taxes should be reduced. Another area which has been giving startup founders sleepless nights is the issue of Angel Tax. An ‘angel tax’ is currently applicable if a startup company receives capital from an angel or HNI based in India and the capital is raised at a value higher than the fair value of shares, then the startup becomes liable to pay 30% income tax on the capital received. As per startups, CBDT has started enforcing this and many startups are receiving notices several years later for a 30% tax liability when they have already used the capital raised. Although CBDT has said that it will not take any immediate coercive action against startups on the angel tax issue, it has not accepted the larger demand of startups which is to accept DCF (Discounted Cash Flow) method as official valuation method. 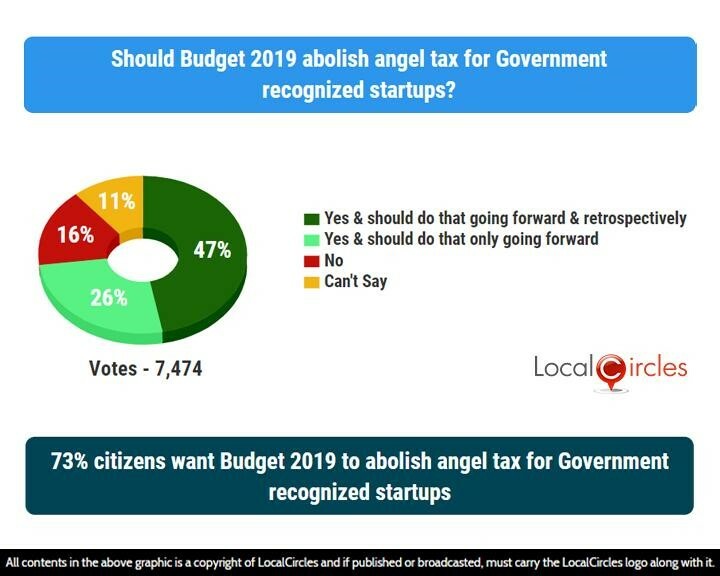 In the next question, startups, SMEs and entrepreneurs were asked if Budget 2019 should abolish angel tax for Government recognised startups, 47% said yes it should be done going forward and retrospectively while 26% said it should be done only going forward. 16% said it should not be done whereas 11% were unsure about it. Pollution in the country is at its peak, especially in north India. On the onset of the winter season, Diwali cracker burning combined with farm stubble burning, makes the air quality worst. The ever increasing number of vehicles in the country are also not doing any favours to the environment. The next question asked what the Government should do in Budget 2019 to control the menace of pollution. 30% said fund capacity should be built to improve municipal enforcement on garbage burning, construction etc. 25% said funds should be allocated to deploy next generation cleaning systems like mechanised street cleaning brooms etc. 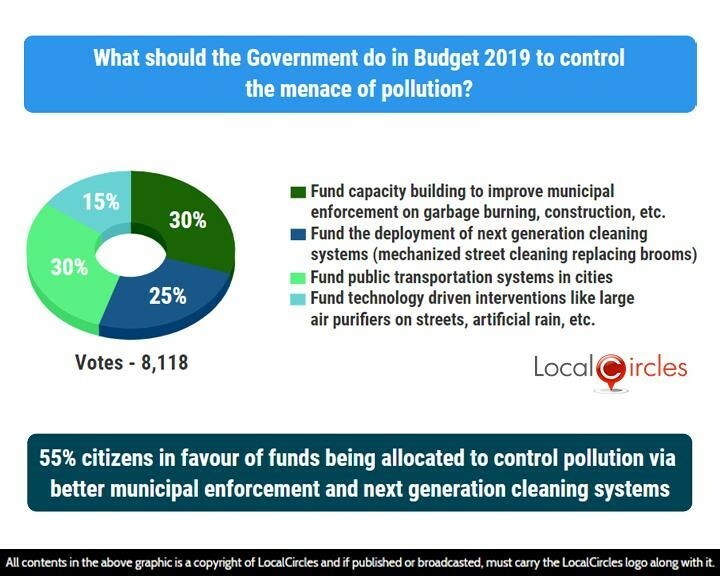 30% said public transportation system in cities should be funded and 15% said funds should be given for technology driven interventions like large air purifiers on streets, artificial rain etc. The agricultural/rural sector has almost been in distress for the last few years. Some states like Uttar Pradesh had announced farm loan waivers to help the farmers but experts said that the economy might take a downturn if more states decide to follow the suit. 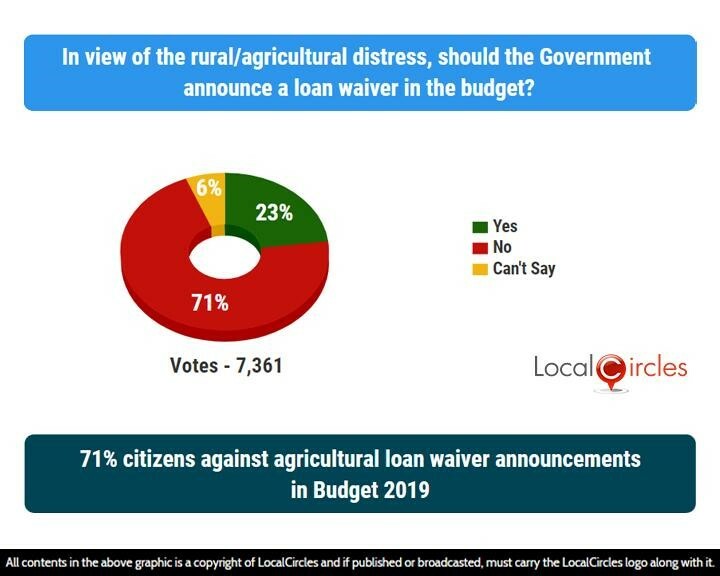 In the following poll, citizens were asked if the Government should announce agricultural loan waivers in the upcoming budget. 71% citizens voted against it while 23% citizens voted in favour of it. Unemployment has historically been a big issue in India. Although the Government has tried to encounter it by launching schemes like MGNREGA, some solid steps need to be taken to eliminate the problem. 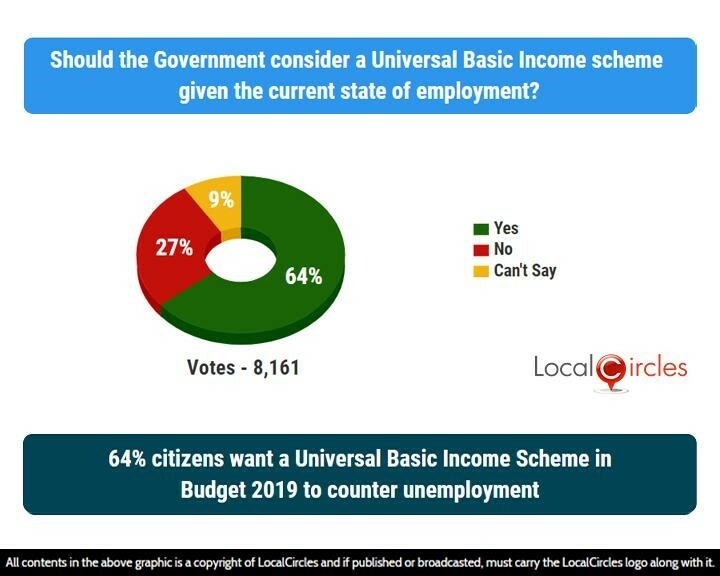 64% citizens said that the Government should consider announcing a Universal Basic Income Scheme in Budget 2019 to counter unemployment in the country. Only 27% voted against such a scheme. The Pradhan Mantri Jan Arogya Yojna or the National Health Protection Scheme was launched earlier in 2018 by the PM and promises to provide health insurance of Rs. 5 lakh each to 10 crore families. 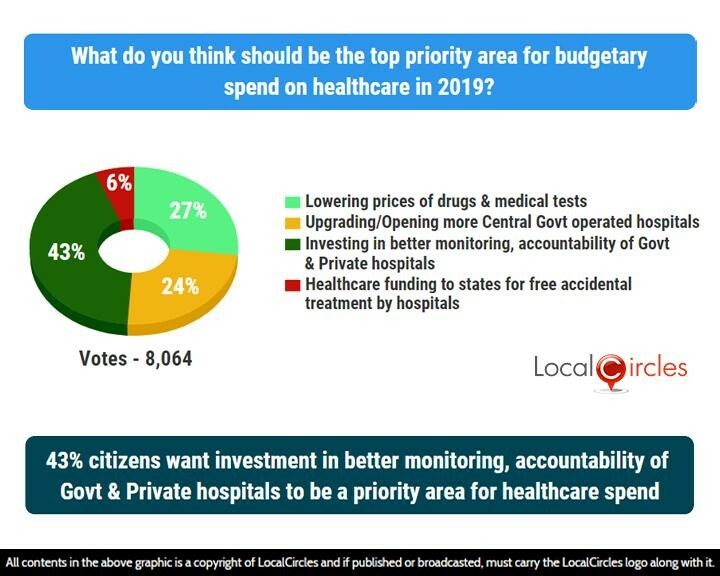 Healthcare has always been a crucial area for budget and when it came to budgetary spend on healthcare in 2019, 43% citizens said that the top priority should be given to investing in better monitoring, accountability of Government and private hospitals. 27% lowering prices of drugs & medical tests should be the priority while 24% want the focus to be on upgrading/opening more central Government operated hospitals. Another 6% voted for healthcare funding to state for free accidental treatment by hospitals. ‘Roti, Kapda aur Makaan’ they say, are the most basic necessities for humans to live. Owning a house has always been a dream for the Indian middle class. With the loan rates being very high, most Indians are forced to stay in rented accommodation instead of buying their own house and paying instalments for the better part of rest of their lives. 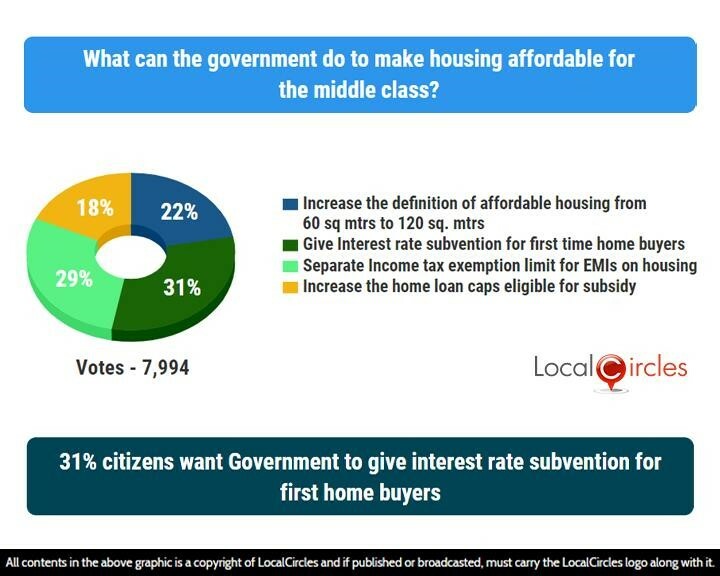 31% citizens in the next poll said Government should give interest rate subvention for first time home buyers to make housing affordable for middle class. 29% said separate income tax exemption limit for EMIs on housing should be made and 22% want an increase in the definition of affordable housing from 60 sq mtrs to 120 sq mtrs. 18% demanded an increase in the home loan caps eligible for subsidy. 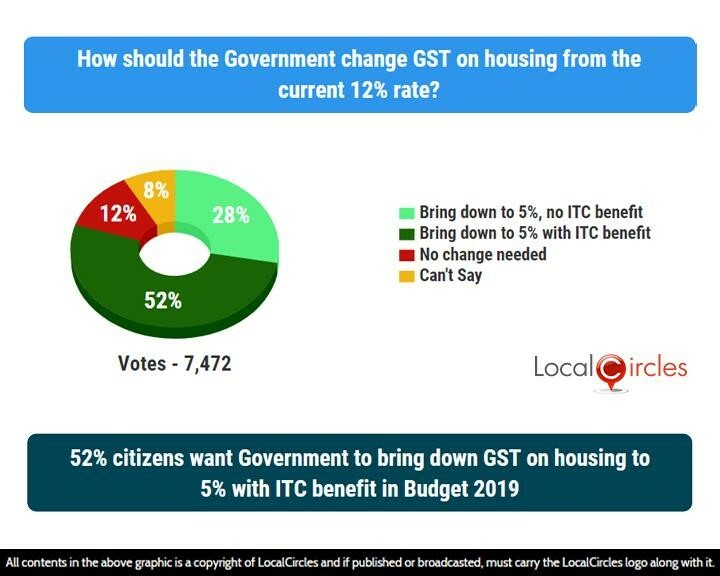 When asked how the Government should change GST on housing from the current 12% rate, 52% said it should be brought down to 5% with ITC benefits, and 28% said it should be brought down to 5% without any ITC benefits. 12% said no changes were needed and 8% were unsure. Over 100,000 responses were received from 40,000+ unique citizens located in 250 districts of India. Approximately 43% of the respondents were women while 57% were men. 58% of the participants were from Metro/Tier 1 cities, 32% from Tier 2 cities and 10% were from Tier 3 and rural locations.